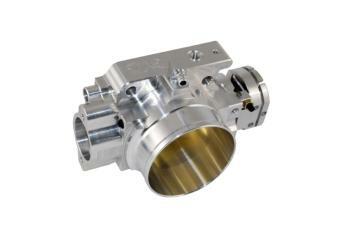 BLOX Throttle Body - Billet Series - Lightning Motorsports - Selling Speed since 1996 ! BLOX Racing billet throttle bodies are currently available for the Honda and Acura D, B, and H-series engines. Each unit is precision machined from AL6061 and features new brass throttle plates, stiffer throttle springs and sealed bearings for quick responses and smooth operation. These high performance throttle bodies are designed as direct-fit replacements and come in various sizes ranging from 66mm to 76mm openings. BLOX Racing billet throttle bodies offer increases in airflow characteristics resulting in horsepower and torque gains. Hardware is included. Reuses stock sensors and throttle cable.